Calculated optical response of silicon nanowires (Y. Ping). The Materials Science & Engineering Initiative (MSEI) at UC Santa Cruz brings together experts in materials synthesis, characterization, and theoretical modelling to form research teams which can respond to research opportunities that require a comprehensive approach. The specific aim of the MSEI is to accelerate the acquisition of fundamental knowledge and workforce training required to develop new materials used in sustainable technologies. These technologies include energy efficient electronics, efficient light harvesting energy sources, and efficient water and desalination devices among others. 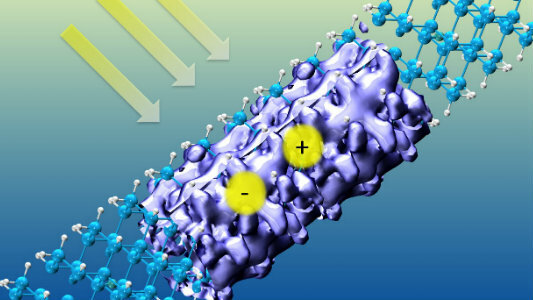 Materials science and engineering not only provides insights into some of the fundamental properties of complex systems in nature, but also can have significant impact on the lives of people by providing avenues for the development of electronic, optical, magnetoelectronic, bio-compatible, and other state-of-the-art devices with new properties. The MSEI helps boost the research mission of UC Santa Cruz by providing a coordinated focus to research in condensed matter physics, physical chemistry and biochemistry, bioengineering, and electrical engineering.